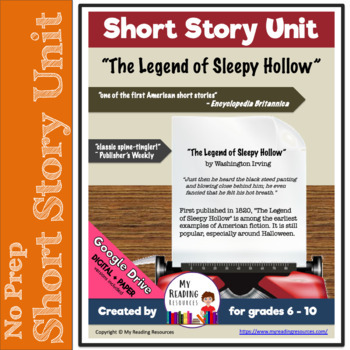 “The Legend of Sleepy Hollow” is known as one of America’s first short stories. It is still loved today, 200 years after it was first published. 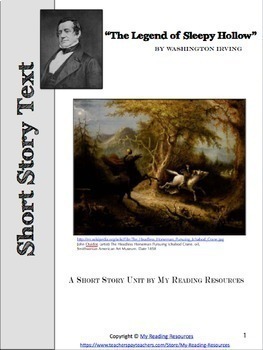 “The Legend of Sleepy Hollow” is the story of Ichabod Crane, a schoolteacher who believes the ghost stories and tales of witchcraft he has heard and read. Ichabod courts the lovely Katrina Van Tassel, mostly because she is the daughter of a rich farmer and is expected to receive a large inheritance. Abraham Van Brunt (also called Brom Bones) is Crane’s jealous rival for Katrina’s affections. Late one night as Ichabod rides home from a party at Katrina’s home, he is frightened by a ghostlike headless horseman. The ghost pursues him and hurls at him a round object that he takes to be a head but is later revealed to have been a pumpkin. The schoolmaster is never seen in Sleepy Hollow again. Years later as the story of the Headless Horseman is told over and over again, Brom Bones always bursts into a hearty laugh at the mention of the pumpkin as he gazes at his wife, Katrina. Review quiz - multiple choice for easy grading! It has the complete, original text with an added glossary to assist in understanding word meanings. The reading level of the text is Flesch-Kincaid 10.4 and Lexile 1440. Student work is divided into 5 sections with vocabulary, multiple choice and short answer questions, and writing prompts for each section. 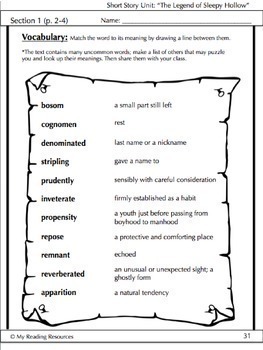 There are analogies and word cards to help your students learn and retain the vocabulary. The questions are designed to meet a variety of CCSS for multiple grade levels. R.L. 1: Students are asked to give evidence from the text to support their answers and inferences. R.L. 2: Students are asked to identify themes and provide a summary of the story. R.L. 3: Students are asked to explain how the setting influences the story and characters. R.L. 4: Students are asked to determine the meaning of words and phrases. R.L. 10: Students are asked to read and comprehend complex text.